I have always been the girl who loves natural products. Here in Latvia, we have a lot of home companies who makes all natural beauty products. The last one I bought was chamomile tonic for skin, you even can't imagine how good it smells. But today I want to talk with you about avocado oil and how much it can do for your skin and hair and health. It's definitely a multi-product and all natural. Avocado oil is and edible oil pressed from the fruit of the Persea americana (avocado). As a food oil, it is used as an ingredient in other dishes, and as a cooking oil. It is also used for lubrication and in cosmetics, where it is valued for its regenerative and moisturising properties. So there's a lot of ways how you can use avocado oil in cosmetic and I will tell you some of them. Avocado oil for skin after shaving. First, where I used this is after shaving your legs or any part of your body. And it's the easiest way too. Simply after shaving you apply avocado oil with a cotton ball and wait till it gets in your skin. Afterwards, your skin will feel so soft as just born babies skin. Avocado oil for longer lashes. Do you dream of longer lashes? Well, there is a simple way how you can make them grow. All you need is castor oil, avocado oil,coconut oil, almond oil, travel size bottle and an old mascara wand you don't use anymore.Use about 3 to 5 ounces bottle and mix equal parts castor,coconut, avocado and almond. Shake all and use disposable wands to apply nightly on brows or lashes. Hot oil treatment. Blend three to five tablespoons of avocado oil (depends how long your hair is) with three to five tablespoons of coconut oil and heat them in a saucepan on a very low heat until warmed to a comfortable temperature. Apply the oil to freshly washed hair and gently massage it in. Cover with a shower cap and leave it for 15 to 20 minutes. Avocado oil for skin wash.
1tbsp avocado oil, 1tbsp shea butter.Melt the Shea butter in a double boiler or in a tablespoon over a candle. Pour the melted shea in a bowl and add the avocado oil. Stir well and let it solidify. You can put it in a fridge. 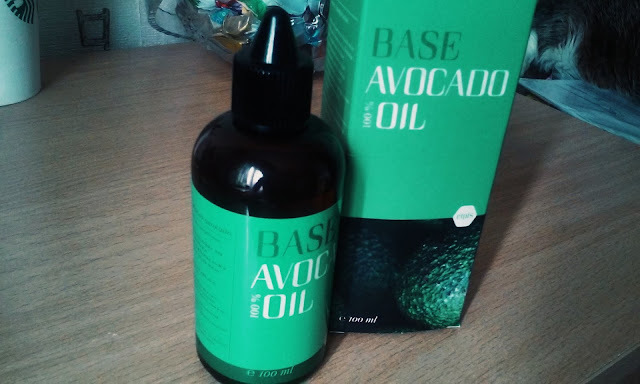 So basically this is all I could find but I'm sure if we all make a little larger research in Pinterest we can find a loot of good recipes how else you can use avocado oil for beauty.